Connie’s Chocolate Fudge Sauce is a delicious dark, decadent chocolate delight! Enjoy it over ice cream or pound cake. It is absolutely wonderful as a Chocolate Fondue with strawberries, pineapple, bananas, oranges, dried apricots, kiwi, pretzels, macaroons and marshmallows. Some people even add a few spoonfuls to coffee or warm milk. Secretly, it has been enjoyed by many on a spoon straight out of the jar! This Chocolate Sauce was Connie’s Grandmother’s recipe. It is an artisanal chocolate that is rich, luscious, dark chocolate sauce that is made of the highest quality ingredients and contains no preservatives or additives and is handmade in very small batches. The chocolate sauce can be enjoyed cold or at room temperature. It is best just slightly warmed and it microwaves well. Connie has been making this chocolate fudge sauce for 25 years, serving it to her friends and family, giving it as hostess gifts, teacher presents and holiday presents. The top of each 8 oz. 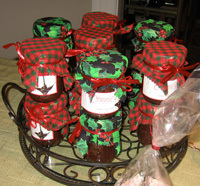 jar is decorated in fabric for each season, holiday or celebration. Quart jars may be special ordered for large party occasions. Also, 4 oz jars may be special ordered for party, wedding or anniversary favors. Coconut Macaroons, Chocolate Peppermint Bark, French Chocolate Bark, Chocolate Granola, and Frosted Pecans are also available. We know you will love Connie’s Chocolate Fudge Sauce. 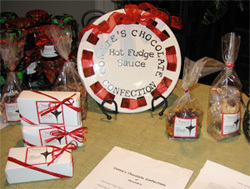 Our chocolate fudge sauce and other confections can be purchased from several Washington DC area locations, at upcoming trade shows or by contacting us directly. For more info, please see "Where to Purchase" and "Upcoming Events" to the right. I walked with my TEAM, "CONNIE'S CHOCOLATES AND FRIENDS FOR THE CURE" on 5/7/16 in the Komen Race for the Cure in Washington, DC. It was nearly six years since my diagnosis and treatment of a very aggressive form of Breast Cancer. I am so very happy to be living life and walking in the RACE for the CURE and still making CHOCOLATE!! 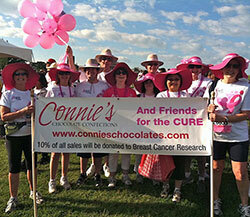 This is the fifth consecutive year that CONNIE'S TEAM has walked in the Komen Global Race for the Cure. To date, CONNIE'S TEAM has raised over $30,000 to help in meeting the GOAL of ENDING BREAST CANCER FOREVER. 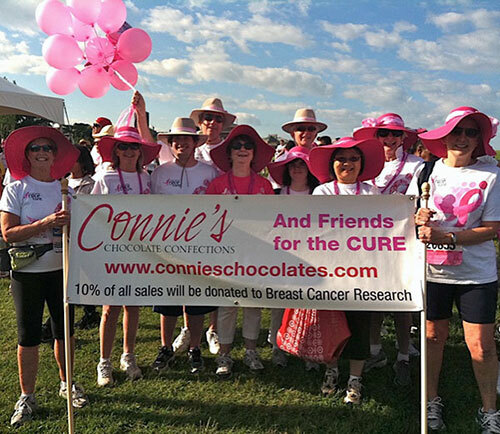 And again this year, for the 5th consecutive year, I have donated 10% of all of my independent sales of CONNIE'S CHOCOLATES to Komen for the Cure of Breast Cancer from 5/1/16 through 5/31/16. ArtStream Arlington Company Performances. Arlington, Virginia. BUT you must mention ArtStream at time of purchase.